Intriguingly, it is often leading firms that develop disruptive technologies first. The problem is that these technologies do not fit the existing value network in which the incumbent operates. As such, the disruptive technologies are starved of resources as the company focuses on sustaining technologies, which are technological improvements that can still be radical, but which are demanded by constituents of the existing value network. For example, flash memory cannot meet the immediate needs of disk drive makers. Yet, there is a separate group of customers whose needs can be met with flash drives. This combination of circumstances would cause leading disk drive makers to avoid investment in flash, whereas new companies grow by serving new markets. If the disruptive technology then improves at a rate that is faster than that demanded by the market, eventually the disruptive technology will be able to meet the needs of the customers of the current incumbents. 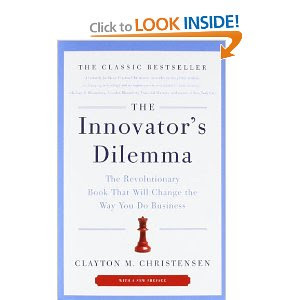 By then, it will likely to be too late for the incumbents to match the now-experienced innovator(s). The key for the innovators is to develop emerging markets that can use the disruptive technology in their applications. This is necessary because existing markets have no need for the technology (yet). For if they did have such a need, the incumbents would be developing the technology themselves to meet the needs of their existing customers.